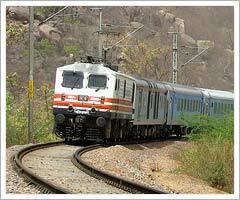 Palace on Wheels is a royal experience, a journey that is much more than a luxury train ride. Palace on Wheels epitomizes the rich Indian heritage and journeys through one of the most exotic regions in the world - Dazzling Delhi, Amazing Agra, and specially Royal Rajasthan. One can relax in comfort and witness exotic India passing by. Boarding the new broad gauge Palace on Wheels one get carried away into the rich world of maharajas, magnificent palaces and imposing forts. The elegant interiors of this luxury train along with appetizing cuisine and personalized service, all exude an exclusive charm. Every tavern has its own personal 'Khidmatgar' or attendant attired in ethnic Rajasthan costume who ensures your journey is comfortable and enjoyable. Fully air-conditioned, the 14 deluxe taverns are equipped with excellent amenities like channel music and intercom which enhance the pleasure of traveling. Each saloon is a combination of 4 twin bedded chambers with attached toilets running cold & hot water and shower facilities. Palace on Wheels was started with the aim of providing the tourists of Rajasthan with a unique and unforgettable experience. The train brings alive the royal era, which was once tantamount with Rajasthan, and takes you on a whirlwind tour of the state. The majestic interiors of the train are completely in sync with the charm and grandeur of the places that you will be visiting on board. The services provided in the car were extended to include a lounge, a library and a bar.